Cozy up for a captivating night of symphonic storytelling under the baton of renowned Australian conductor Simone Young as she conducts Rimsky-Korsakov’s Scheherazade. Stop by our video photobooth to star in your own Arabian Nights tale. Get free swag by being one of the first 100 students*. Win a pair of tickets to an upcoming concert. Enjoy a craft cocktail with your friends. 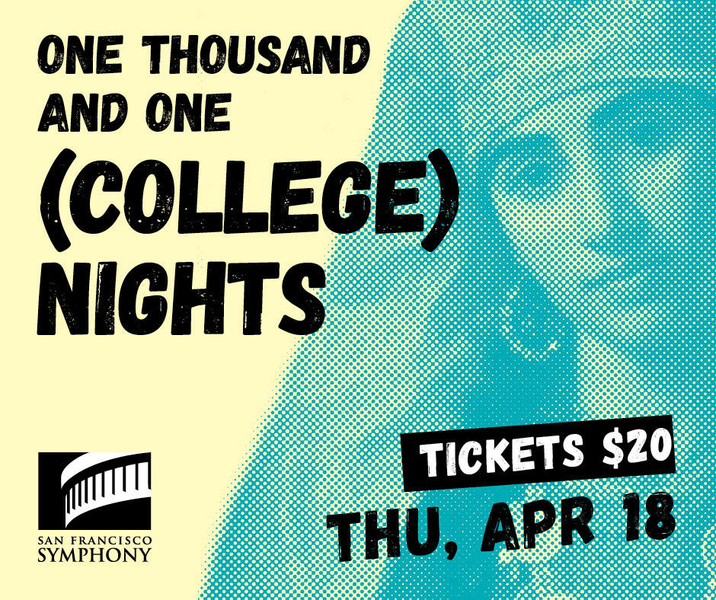 Purchase your tickets to College Night by 3 p.m. on April 1 and be automatically entered to win a pair of tickets to the Exploratorium After Dark! ** Get ‘em while you can — tickets are just $20! Not yet a member of our Student Rush program? Register now for access to more $20 tickets to the Symphony, every week! *Gift limited to 1 per guest per visit. Must show concert ticket at table to redeem gift. **Offer valid until 12/31/19. Only valid on Thursday evenings during Exploratorium After Dark. Not valid for daytime museum admission. Must be 18+ to enter Exploratorium After Dark and 21+ to consume alcohol. ***This program is designed for Undergraduate and Graduate students. Must be a full-time college student to be eligible. Must provide valid student photo ID at registration. Limit 2 tickets per student, per concert.